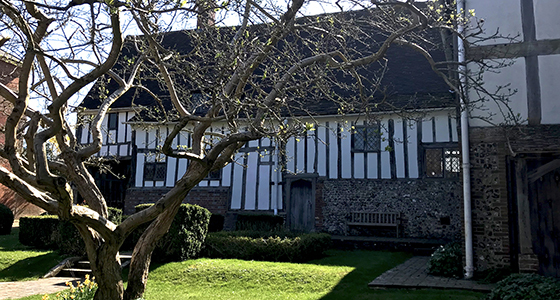 This handsome Tudor house that once belonged to Thomas Cromwell before being given to Anne by Henry VIII, on their divorce, is more than 500 years old. It's now surrounded by more modern buildings but in its time would have been a prestigious rural household. Unfortunately a full record of former tenants no longer exists but it was once sold to Richard Kyme, whose voice we may have captured in the Lewes Gallery and is featured on the video. It's very easy to feel at home in Anne's beautiful house, despite it being open to the public it retains a very personal atmosphere. Of course it hasn't been just Anne's house, which is why we picked up such a diverse range of voices. Some of those we heard from we assume to be related to the Tudor era but EVP clips 2 and 5, sound much more recent in their phraseology. The building sits on the outskirts of the town centre on a fairly busy minor road. Whilst road noise is not overly intrusive in the recording, certain voice clips were discounted because of those walking by. It would be effortless to loose yourself in time here but we had only a short window to record in before the entry of other visitors, nevertheless the recordings are noteworthy for their contextual content. EVP 1: It is very heartening to hear mention of Henry VIII at Anne's house. Of course we always hope to hear from him, or from anyone in his court. Sadly there aren't any recordings of Henry to compare our EVP to but even if we're deluding ourselves, it's an enjoyable exercise to think we may have a link to one of our greatest monarchs. EVP 2: As you walk into the Wealden Iron Gallery on the lower floor of the house, the smell of hot tar fills your nostrils. It didn't take us long to find that the source of the pong was the large cast iron cannon and its wooden plinth. The speakers comments are important because they highlight two key attributes in intelligent EVP, a directly relevant reply and the replication of the word subtle by Rachel towards the end of her statement. EVP 3: Since the group began recording at Hampton Court Palace in 2014, the name Walter Raleigh has featured at many locations, not all of these have documented visits. Could it be that he's curious in Rachel's work as they both have an interest in sea navigation, as well as the Tudor Period? We hope one day to find out. EVP 4: This collection of voices was captured in The Parlour, soon after Francesca and Rachel entered. Rachel could see a group of people dressed in period clothes watching them from the far end of the room. It's always a surprise to record a voice that corroborates an observation and a delight when more than one voice is heard. EVP 5: Because of the uncontextual content of this clip, it was not featured on the video. It was heard on the recording from the Wealdon Iron Gallery but sounded unrelated to any of the conversations that took place. What makes it stand out is the clarity of speech and unambiguous words. If they have meaning, sadly it's lost on us.